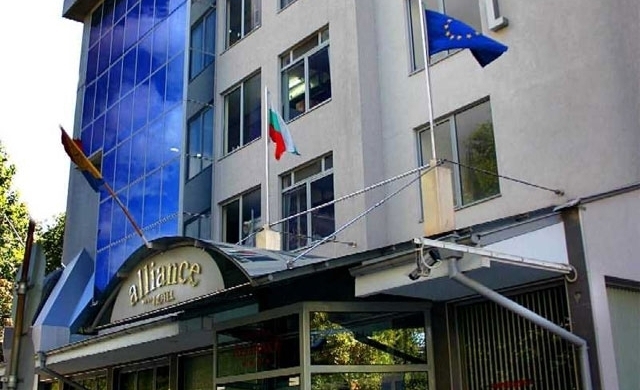 Location: Located in the center of Plovdiv, Alliance hotel is just at the Plovdiv Railway Station, а five-minute walk away from the centre and less than a ten-minute drive from the Plovdiv International Fair. The Old Town of Plovdiv is just at a 15-minute walk from the hotel. Accommodation: Hotel Alliance has a capacity of 86 beds. The rooms are spacious- above 30 sq.m. Each standard room is equipped with: air-conditioning system, controlled by the guests; mini – bar; cable TV with over 50 channels in different languages; own bathrooms with showers and tubs; direct telephone dialing and connection to the Internet from each room; radio; twin beds or a king-sized bed. Food: Restaurant designed in two separate salons fully air-conditioned, with a fireplace, large TV screen and musical surround. The restaurant offers to the customers a wine list to choose from a variety of 120 different brands of wine of all sorts. Other services: 24-h guarded underground car-parking, free Wi-Fi and cable Internet in each room and suite and all around the hotel; special room for disabled people, equipped according to all standards and a wheel-chair; a high-standard conference hall.